Please complete the form below and your enquiry will be sent directly to The Big Time Fishing Charters via email. Your enquiry has been sent to The Big Time Fishing Charters. If you enjoy the fresh smell of sea air and revel in the thrill of catching mounds of fish that will make any seafarer jealous, then The Big Time Fishing Charters is the big one that you can’t allow to get away. All you need is a standard angling permit (available at any post office) and you can embark on a fishing experience that includes a complete chartering experience. 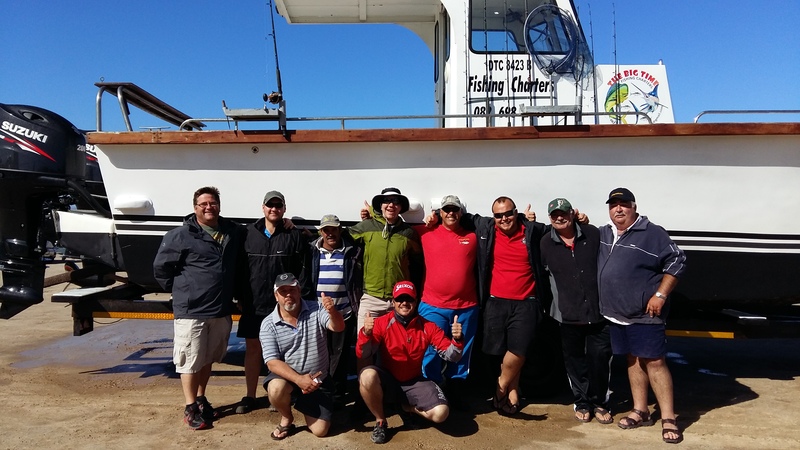 The Big Time Fishing Charters run a range of day trips as well as a variety of two-day-two-night fishing experiences that launch from the Gansbaai Harbour. This team of highly experienced fishermen have salt water running through their veins and know all the right spots to catch big name fish like Yellowtail, Cob, Dorado, Tuna and many more. Whatever your nautical needs, The Big Time Fishing Charters will ship you off to the Atlantic Ocean for a fishing adventure of note. Click on ‘More Info’ below to find out more about The Big Time Fishing Charters. Owner and captain Louw Hugo, started his career as a fisherman when he was only six years old and has never looked back since. 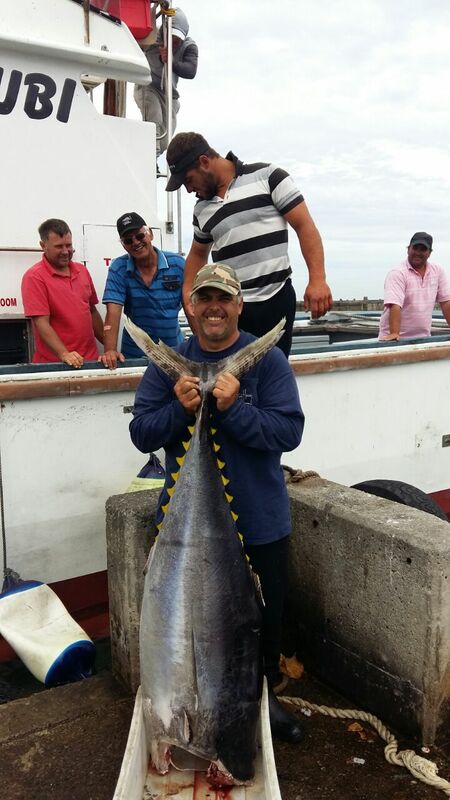 With over 20 years to his name as a commercial fisherman, Louw has first-hand experience when it comes to fishing techniques, and is driven to make sure that all his clients have a catch to take home. Each trip is meticulously planned based on your individual needs, wants and the weather conditions, and you can rest assured that you are in safe hands with this highly skilled and charismatic captain. If you're feeling peckish your captain is more than willing to cook your catch for you. Expect a barrel of laughs to accompany your barrel of fish, and expect to make friends while you create classic memories. The 16 meter repurposed Japanese military patrol vessel has all the fittings and trimmings to comfortably stay out at sea for several days, and boasts a 15-20 ton cargo hold filled with ice for the masses of fish you’ll be catching. There is a galley and a head with shower and toilet facilities on board, which makes the boat perfect for long journeys. Pre-launch checks are always done before a trip to ensure the boat is seaworthy and ready for action. The Big Time Fishing Charters offer an enticing choice of day trips, based on the desired catch of the day. Whether you’d like to catch Red Roman, Cape Galjoen, Red Stumpnose, Silver Fish, Cape Salmon, Cob or any of the other local reef fish, Louw and his team will make sure to take you to the best fishing spots to do so. While you will need to have your own standard angling permit to be able to fish, a fishing rod and bait will be provided. Day trips typically depart from the Gansbaai Harbour at 7am, but certain fish will require departure just before sunrise. While the duration of the trip depends on catch and client appetite, the boat typically returns to the harbour around lunch time, so expect to spend around five hours at sea. While day trips are centred around fishing, it is more than likely that you will see a lot more than fish. Walker Bay offers bountiful fishing opportunities and gorgeous sea life such as seals, whales and sharks. NOTE: Day trips are weather dependent. Immerse yourself in a wonderful fishing experience. This trip spans two days and two nights, and takes place between the months of November and March. Embark on a ten to twelve-hour cruise, 112 nautical miles out to open sea. 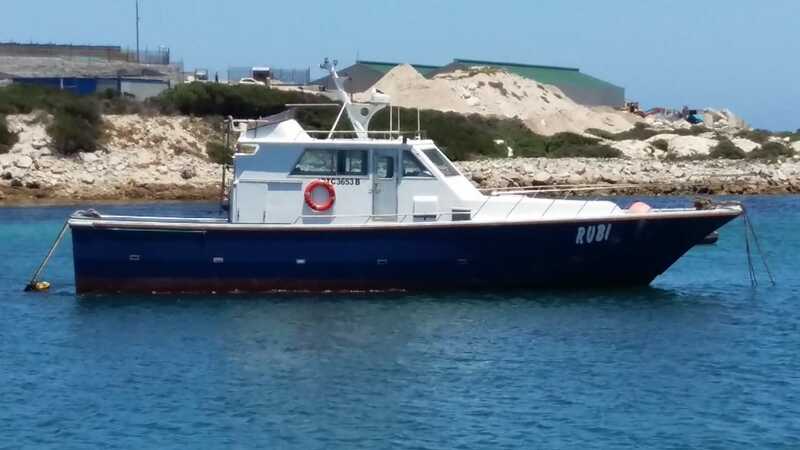 Depart from the Gansbaai harbour in the late afternoon and sleep the night away while your Big Time crew steer the vessel toward your fishing destination. Start your first day by waking up at the crack of dawn when you try your hand at catching early morning fish like Marlin and Cape Salmon. Fishing continues throughout the morning and early afternoon when you try and hook local reef fish such as the Red Roman and Silver Fish. Spend the late afternoon and evening trawling the seas where you can max out your ten fish per day quota as set out in the standard angling permit. Enough food is provided on the boat for everyone to keep their tummy’s full but you are more than welcome to prepare your day’s catch. Please remember that alcohol is not permitted on board. Enjoy the night sky with a canopy of stars that will shine brighter out at sea. Guest appearances occur so don’t look up too long, you may just miss the dolphins and flying fish that appear after dark. After being lulled to sleep by the motion of the ocean you will wake fresh and ready to reel them in again. Spend another full day out at sea, exploring different fishing spots before starting to make your way back toward Gansbaai in the evening. Be prepared to arrive back in Gansbaai in the early hours of the morning on the third day. Embark on a two-day and two-night trip that will take you on five hour journey 60 nautical miles out to the Cape Point Canyon. These trips take place from November to March each year. 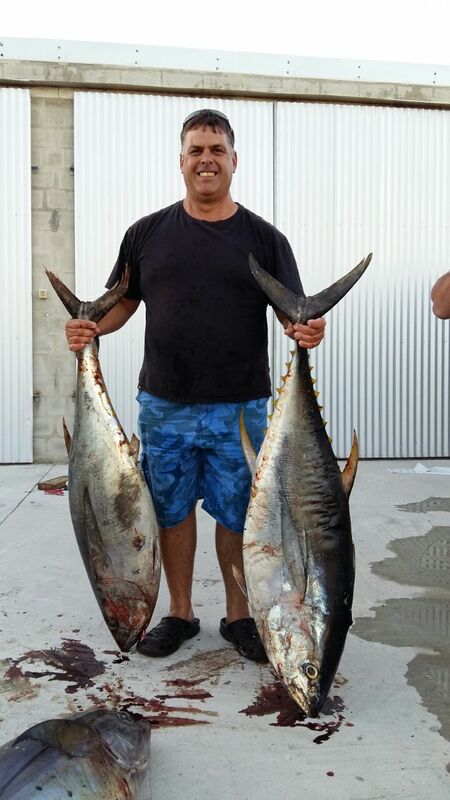 Take up to five fishing buddies with you and try your luck at bringing in a monster tuna. All the necessary angling equipment will be provided for you, such as specialised tuna fishing rods and bait. Meals are catered for and there will be enough food for you and all your companions. There are kitchen and bathroom facilities onboard so you will have everything you need out on the open sea to fish in-style. Please remember that alcohol is not permitted on the boat. Start your adventure by traveling to the Cape Point Canyons where you will immediately cast your reels on arrival and wait for the big fellas to start biting. Four reels are allowed in the water at once, two at the bow and two at the stern. Once the bait is taken, all other reels must come out of the water to ensure the maximum chance of bringing that prized Tuna aboard. After wrestling with giant Tuna for the entire day, enjoy a relaxed evening telling your fishing companions your favourite fishing stories. Keep an eye out for inquisitive dolphin and amazing flying fish. Start the day feeling well rested and determined to catch the Tuna that eluded you on day one or quite simply catch one of his friends to come join the one you did catch! The boat will make it’s way back to Gansbaai that night, arriving back in the harbour in the early hours of the third day. Are you looking for something special and totally out of the box to do for any special occasion or event? Well look no further...The Big Time Fishing Charters has got just what you need. The Big Time Fishing Charters offering individuals, groups, families and companies the opportunity to hire a state of the art fishing boat for a custom created fishing trip. Do you and the boys go on a spearfishing fishing trip every year? The Big Time Fishing Charters has the perfect spearfishing charter for you. Do you want to do something special for this year’s end of year function? No problem. The Big Time Fishing Charters will host the party you and your work colleagues will remember forever. Maybe you want to have a totally out their bachelorette party, The Big Time Fishing Charters have you and your besties covered. You get to choose when you want to embark from the harbour and where you want to go, weather permitting of course. With onboard kitchen and bathroom facilities, you can stay comfortably onboard for as long as you like...well, almost. A whole lot of fishing fun!